The entry form for the 2012 Impact Awards Competition can now be downloaded. ▪ STATUETTES AVAILABLE TO ALL PARTICIPANTS & WINNERS. All entrants are entitled to ordering participant/winner award statuettes. These materials are produced in-house from optical crystal and usually ship within 48 hours. ▪ ENHANCED RESULTS KITS. Now 16+ pages of competition coverage, individual metrics and feedback; a CD packed with resources; and other important supplemental materials. Nothing distinguishes your work and brings recognition to you and your team more than honors from the 2012 Impact Awards. The Impact Awards recognizes the outstanding people, practices, programs and partnerships in Public Relations and Communications during the past twelve months. From Abbott to Zurich Financial, organizations large and small compete against peers of similar size, staff, and means to earn recognition for their organization's achievements. Here's your chance to earn due recognition for your hard work in communications. As one of the the world's premiere strategic communications competitions, the Impact Awards provides a platform for communications professionals to demonstrate the value they're delivering to their organization. Judged across a broad range of criteria, awards are presented across two tiers: winner and honors. Ratings are based upon an evaluation point system, which considers a number of factors measuring the effectiveness of communications materials. The Call for Entries concludes 12 April 2013. (26 April 2013 with extension fee.) So don't delay; be sure to submit your entry today! � Full-Blown Winners Kits. Tailored especially to you and your results, these kits walk you through the entire judging process and provide you with your individual results. 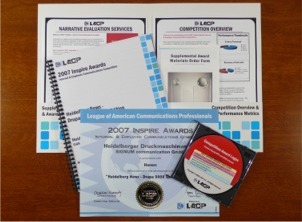 This kit is an excellent addition to any communicator's portfolio. � Recognition with the News Media. Top-performing honorees are highlighted in LACP's Impact Awards press announcement, sent to the top news outlets around the world. The deadline to submit entries for this year's competition is 12 April 2013. Winners will be announced and awards distributed on 13 May 2013.